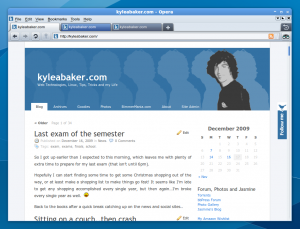 I’ve been using a new theme lately for Ubuntu that is based on the appearance of Google Wave. One thing that I hate about Opera in Linux is that it doesn’t automatically inherit the current themes appearance. The only way to make Opera match your current theme is to download a skin for that theme or to make one yourself. I’ve decided to modify the standard skin by updating the background behind the tabs and changing the scrollbar images to match the rest of my current themes scrollbars. There are still several more tweaks to make, but for now I’m very satisfied with the integrating feel that these small changes have made. I may upload this Opera skin later, but not while I’m still tweaking it. In the meantime, if you want this skin then just contact me and I’ll send you what I’ve made so far. Hello, I’m also a opera fan and interested in the google wave skin. It’s very kind of you if you can send it to me. Thanks very much.